An unaltered photocopy of your DD-214 (post WW2), OR unaltered photocopy of WD AGO 53-55 (WW2) displaying your CMB authorization. If your Report of Separation (DD-214, etc) does not display your CMB you must ALSO provide an unaltered photocopy of your authorization orders. 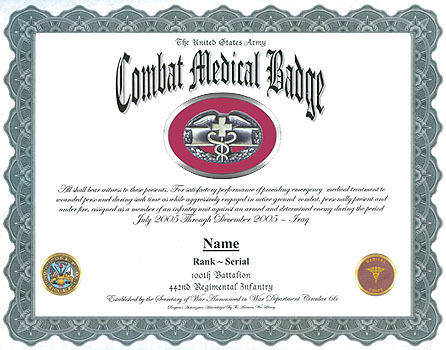 The Combat medical Badge (CMB) was originally established as the Medical Badge and was designed to recognize the important role and service of medical personnel assigned or attached to infantry units and who daily shared with the infantry, the hazards and hardships of combat during World War II. War Department Circular 66, dated 1 March 1945, authorized the award of the Medical Badge to officers (field grade officers were not authorized the award of the badge except for battalion and regimental surgeons), warrant officers and enlisted personnel whose daily performance was satisfactory under combat conditions. The award of of the Medical Badge was made retroactive to 7 December 1941. The Medical Badge could be withdrawn by commanders from individuals who failed to perform their duties satisfactorily under combat conditions. It also was withdrawn on a temporary basis from personnel who were transferred or assigned outside the Medical Department to duties in which the individual may come in contact with the enemy. This was in order not to impair the protected status of regularly assigned medical personnel. in such cases, the right to the Medical Badge was restored on relief from combat duties or on reassignment to the Medical Department. That during the present war and for six months thereafter, any enlisted man of the Army who is entitled, under regulations prescribed by the Secretary of War, to wear the Medical Badge shall be paid additional compensation at the rate of $10 per month: Provided, That any enlisted man whose right to wear the Medical Badge has been temporarily suspended may, under regulations prescribed by the Secretary of War, continue to be paid such additional compensation. On 8 February 1951, the Army Chief of Staff approved the addition of stars the Combat Medical Badge to indicate subsequent awards of the badge in separate wars. Army Regulation 672-5-1 provides that the Combat Medical Badge may be awarded to members of the Army Medical Department (colonels and below), the Navy Medical Department (captains or below) or the Air Force Medical Service (colonels and below) assigned or attached to the Army, and who have satisfactorily performed medical duties subsequent to 6 December 1941 while assigned or attached to a medical unit of company or smaller size organic to an infantry unit of brigade, regimental, or smaller size, during any period the infantry unit was engaged in active ground combat. (1) Originally established as the Medical Badge, the Combat Medical Badge (CMB) was created by the War Department on 1 March 1945. It could be awarded to officers, warrant officers, and enlisted men of the Medical Department assigned or attached to the medical detachment of infantry regiments, infantry battalions, and elements thereof designated as infantry in tables of organization or tables of organization and equipment. Its evolution stemmed from a requirement to recognize medical aidmen who shared the same hazards and hardships of ground combat on a daily basis with the infantry soldier. Though established almost a year and a half after the CIB, it could be awarded retroactively to 7 December 1941 to fully qualified personnel. (2) Like the CIB, the Regimental Commander was the lowest level at which the CMB could be approved and it also carried with it a separate provision for enlisted badge holders to receive a $10 per month pay stipend. (3) The CMB could be awarded to Medical Department personnel assigned or attached to infantry units of Allied Forces when the duties performed were identical with those performed by medical personnel assigned or attached to U.S. Forces. (4) The CMB could also be awarded to U.S. Navy and U.S. Air Force medical personnel provided they met all the requirements of Army medics. (5) Effective 20 December 1989, special forces personnel possessing Military Occupational Specialty 18D (Special Operations Medical Sergeant) became qualified for award of the CMB provided they were otherwise qualified. (6) In 1991, the Chief of Staff, Army authorized a limited expansion of CMB eligibility to include medical personnel assigned or attached to armor and ground cavalry units provided they meet all other qualifying criteria. This expansion was retroactive to 17 January 1991 to cover the period of Operation DESERT STORM. (1) The CMB was created as a "companion" badge to the CIB with criteria for its award intended to parallel that of the CIB. It was designed to provide recognition to the field medic who accompanies the infantryman into battle and shares with him the experiences unique to the infantry in combat. There was never any intention to award the CMB to all medical personnel who serve in a combat zone or imminent danger area, that is, a division-level medical company supporting a maneuver brigade. (2) As with the CIB, the infantry unit to which the medical personnel are assigned or attached must engage the enemy in active ground combat. Since inception, the intent of the Department of the Army regarding this requirement has been that medical personnel must be personally present and under fire in order to be eligible for the awarding of the badge. So stringent was this requirement during the Vietnam era that recommending officials were required to document the place (in six digit coordinates), time, type, and intensity of fire to which the proposed recipient was exposed. This fact naturally precludes the awarding of the badge to those medical personnel who accompany infantry units into a potential engagement area but do not come under enemy fire. (3) Over the years, there has been some confusion concerning the phrase "...in direct support of an infantry unit...". The CMB is intended for, and awarded to, those medical personnel who accompany the infantryman into combat. The Army has never approved of deviations from this purpose and its restrictive criteria. During the World War II era, medical support for infantry units in combat was provided by the medical detachments and companies of battalions and regiments. These medical personnel and units were termed direct support. This concept lasted until Vietnam. Today, medical personnel are assigned as organic personnel to infantry companies and are regarded as participants as opposed to being categorized as those providing direct medical support. For example medical personnel serving in division-level medical companies, ground ambulance and medical clearing companies, mobile-Army surgical hospital (MASH), combat-support hospital (CSH), and field hospitals, and aeromedical evacuation units are not eligible for the CMB. The sole criteria which qualifies medical personnel for award of the CMB is to be assigned or attached to an infantry unit engaged in active ground combat. Medical personnel other than those medics organic to infantry units may qualify only if they serve as medical personnel accompanying infantrymen. Conceivably, this could occur if an infantry unit lost all its medics and as a temporary or permanent measure medical personnel were attached to an infantry unit, but remained assigned to a hospital or other non-infantry unit. (b) Subsequent to 19 December 1989-Special Forces personnel possessing military occupational specialty 18D (Special Operations Medical Sergeant) who satisfactorily performed medical duties while assigned or attached to a special forces unit during any period the unit is engaged in actual ground combat, provided they are personally present and under fire. Retroactive awards are not authorized. (c) Subsequent to 16 January 1991-Personnel outlined in (a) above, assigned or attached to armor and ground cavalry units of brigade or smaller size, who satisfactorily perform medical duties while the unit is engaged in actual ground combat, provided they are personally present and under fire. Retroactive awards are not authorized. (2) Awards will not be made to general or flag officers. (1) To date, a separate award of the CMB has been authorized for qualified soldiers who served in World War II, the Korean War, and the Vietnam Conflict. Service in the Republic of Vietnam conflict combined with qualifying service in Laos (19 April 1961 to 6 October 1962), the Dominican Republic (28 April 1965 to 1 September 1966), Korea on the DMZ (after 4 January 1969). Grenada 23 October to 21 November 1983), Panama (20 December 1989 to 31 January 1990), and the Persian Gulf War (17 January to 11 April 1991) is recognized by one award only regardless of whether a soldier has served one or multiple tours in any or all of these areas. If a soldier has been awarded the CMB for service in any of the Vietnam era areas, that soldier is not eligible to earn the Combat Infantryman Badge. (2) Second and third awards of the CMB are indicated by superimposing 1 and 2 stars respectively, centered at the top and bottom of the badge. (1) Subsequent to 1 March 1961, a soldier must have been assigned to a Vietnamese unit engaged in actual ground combat or as a member of a US army infantry unit of brigade or smaller size, including Special Forces Detachments, serving with a Republic of Vietnam unit engaged in actual ground combat. The Republic of Vietnam unit must have been of regimental size or smaller and either an infantry, ranger, infantry-type unit of the civil guard, infantry-type unit of the self-defense corps, or of the irregular forces. The soldier must have been personally present and under hostile fire while assigned as specified. (2) Subsequent to 24 May 1965, soldiers serving in U.S. units must meet the requirements of c(1) above. Soldiers who performed liaison duties with the Royal Thai Army or the Army of the Republic of Korea combat units in Vietnam are eligible for award of the badge provided they meet all other requirements. (1) Assigned as member of a White Star Mobile Training team while the team was attached to or working with a unit of regimental (groupment mobile) or smaller size of Forces Armee du Royaume (FAR), or with irregular-type forces of regimental or smaller size. (2) A member of MAAG, Laos assigned as an advisor to a region or zone of FAR, or while serving with irregular type forces of regimental or smaller size. g. Dominican Republic. From 28 April 1965 to 21 September 1966, the soldier must have met the criteria prescribed in b and c above. (1) Have served in the hostile fire area at least 60 days and be authorized hostile fire pay. (2) Have satisfactorily performed medical duties while assigned or attached to a medical unit of an infantry unit of brigade, regimental, or smaller size, or as a member of a medical platoon of an infantry or airborne brigade headquarters company; must have been physically present during any period in which the infantry unit was engaged in active ground combat involving an exchange of small arms fire at least five times. (3) Be recommended personally by each commander in the chain of command and approved at division level. If killed or wounded as a direct result of overt enemy action he must be recommended personally by each commander in the chain of command and approved at division level. In the case of medical personnel killed by enemy action, the requirement for at least five engagements ((2) above) and the requirement for the incident to have taken place in the hostile fire area, including the 60 day requirement ((1) above) will be waived. In the case of individuals wounded, even though outside the hostile fire area, the five engagements requirement and the 60 day requirement may be waived when it can be clearly established that the wound was a direct result of overt hostile action. i. Grenada (Operation URGENT FURY). 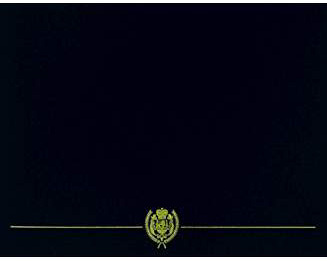 From 22 October 1983 to 21 November 1983, the soldier must meet the criteria prescribed in c(l) above. j. Panama (Operation JUST CAUSE). From 20 December 1989 to 31 January 1990, the soldier must meet the criteria prescribed in c(l) above. k. Persian Gulf War (Operation DESERT STORM). From 17 January 1991 to 11 April 1991, the soldier must meet the criteria prescribed in c(l) above. by providing medical care to all who are in needs. for those who need my assistance. in your presence and never-failing love.